1. 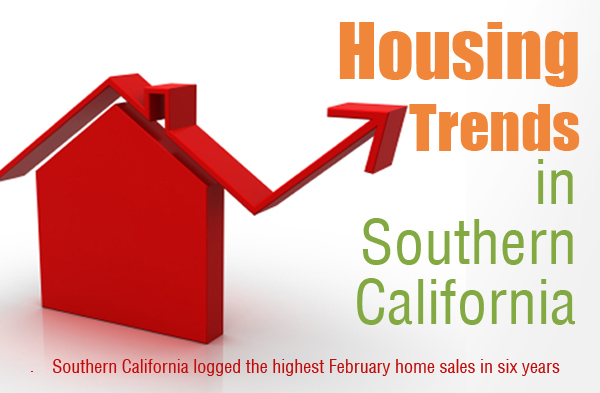 Southern California logged the highest February home sales in six years. 2. The median sale price was slightly lower than January but was almost 21% more than February 2012. 3. 15,945 new and re-sale houses and condos sold in Los Angeles, Riverside, San Diego, Ventura, San Bernardino and Orange counties. This was 0.7% less than January 2013 but 1% up from February 2012. 4. The median price for all new and re-sale houses and condos sold in the Southland area was $320,000; down from $321,000 in January 2013 and up from $264,750 in February 2012. 5. The median price for a three-bedroom, two-bath, 1,250-1,450 square-foot house built between 1950 and 1985 was $316,500 last month. This was down 0.2% January 2013 and up 13.4% from $279,000 in February 2012. 6. The number of homes, costing between $300,000 and $800,000, rose 33.4% from February 2012. 7. The number of houses that sold for $500,000 or more jumped 54.0% from February 2012 while sales of $800,000+ homes increased 62.7%. 8. Short sales made up an estimated 22% of re-sales in Southland, down from an estimated 24% in January and 26.9% in February 2012. 9. The most active lenders in Southern California were Wells Fargo, Prospect Mortgage, and JP Morgan Chase. 10. The typical monthly mortgage payment committed to by South land owners was $1,154, up from $1,140 in January and $998 in February 2012. Looking at these trends, there seems to be a definite improvement in the housing market in the land of the the stars. Surely, people who have been thinking of selling their homes will now be keen to list their homes, since prices are higher than last year. For more information about mortgage related IRS forms, please visit 4506-Transcripts. This entry was posted in Trends and tagged housing market, Housing Trends, IRS forms, Re-Sales, Sales Price, Southern California. Bookmark the permalink.